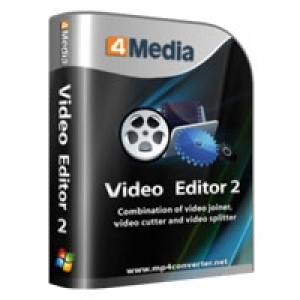 4Media Video Editor 2 can provide you with comprehensive video editing functions which can join separated videos even in different formats together, cut video clips to remain necessary segments and split video files by size, time duration or copies. 1.Join a few videos together, even in different formats, to compose a new video file. 2.Cut video clips freely to retain the necessary parts in a video file. 3.Split one video file into several segments to get the proper length for actual need. 4.Various input and output video formats are supported, including AVI, MPEG, WMV, MP4, FLV, MKV, H.264/MPEG-4, DivX, XviD, MOV, RMVB, ASF, 3GP, 3G2, SWF, VOB, TS, DV H.264/MPEG-4 AVC (*.mp4), MPEG2 HD Video (*.mpg; *.mpeg), MPEG-4 TS HD Video (*.ts), MPEG-2 TS HD Video (*.ts), Quick Time HD Video (*.mov), WMV HD Video (*.wmv), Audio-Video Interleaved HD Video (*.avi). 5.Built-in media player can provide a real-time preview on the original videos as well as the output after editing. 6.Apply fade-in or fade-out effect between video segments to enrich the output when merging several video together. 7.You can clip more than one clips for one source video and output all the clips as one video file. 8.In splitting a video file, you are able to divide yhe video manually by setting split points. As an alternative, you can also split video automatically be preset size, time duration or copies. 9.It is optional to keep the original format or select another profile when output video clips. 10.Change the output video size and quality freely. Moreover, a batch of audio and video parameters are adjustable to personalize the output effect, like Bitrate, Frame Rate, Zoom, Ratio, Volume and so on. 11.Post-task actions, system power management and multilingual interfaces are available. A fun and interactive software program for converting movies into cartoonized animated GIFs. Increase the Volume of your Video with this handy little tool . 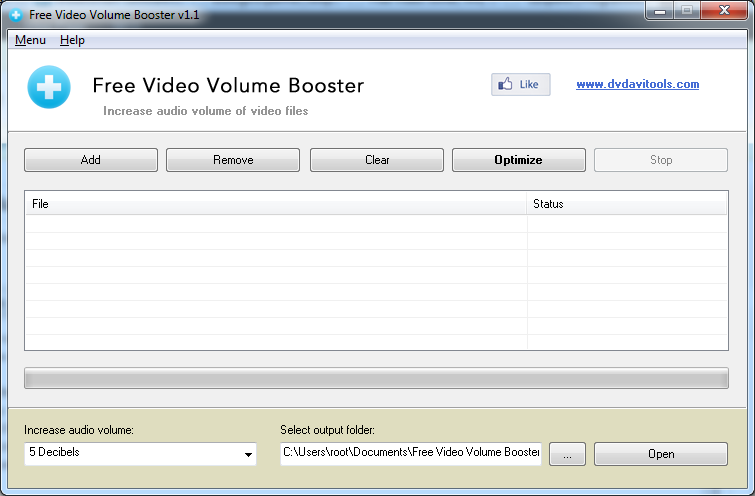 Free Video Volume Booster is a free software used to quickly increase the sound volume of any video file.